I’m always happy to answer questions dealing with issues related to food politics. Here are responses to two that came in last week. I’ll do another two sometime this week. Q1. I was just introduced to your book, What to Eat, and I read it, cover to cover, thoroughly enjoying each area of the market. I am emailing in hopes that you have a suggested iPhone App, which suggests or promotes healthy eating. Not so much calorie counter Apps, but Apps which make suggestions towards healthier options or perhaps even suggests macro or micronutrients which we may be lacking based on the foods we are purchasing and consuming. Any help is much appreciated! Thanks! A. I’m a diehard BlackBerry user and haven’t a clue. Readers: suggestions? Q2. I’m an NYU MPH student and will probably be taking your Food Advocacy class next spring. I adore your blog and as of late have been especially appreciative of your Farm Bill breakdowns. (What a confusing document!) I was wondering what your take was on the NYTimes article that appeared in the Week in Review on Sunday titled, “Breeding the Nutrition out of Our Food” by Jo Robinson. Have we really been losing the phytonutrients in our food since we became farmers? A. Ms. Robinson, whose terrific new book, “Eating on the Wild Side” is out this week, collected data on phytonutrient (plant antioxidant) levels in wild foods and their bred-to-be-less-bitter supermarket counterparts. The wild ones have more, but they usually don’t taste as good. The idea that foods now are less nutritious than foods in the past fits conveniently with concerns about our industrialized food system. But data on trends in nutrient content are difficult to come by (the methods change over time), and differences in health benefits are impossible to assess. The bottom line: people who eat fruits and vegetables—even supermarket varieties—are healthier than people who don’t. Would they be even healthier if the vegetables were more bitter because of the phytonutrients? Hard to say. I’m going to eat my veggies and not worry about this one. The Mediterranean diet: a delicious way to prevent heart disease? In my April (first Sunday) Food Matters column for the San Francisco Chronicle, I catch up with the Mediterranean diet study first published online on February 25 (and widely publicized), and just now in print in the New England Journal of Medicine. Q: I read about a study (New England Journal of Medicine, April 4) claiming that Mediterranean diets prevent heart attacks. Does this mean I can stop worrying about eating pasta? A: That study, alas, was not about pasta. It wasn’t really about Mediterranean diets, either. Instead, it was about the benefits of supplementing healthy, largely vegetarian diets with olive oil or nuts. We usually think of Mediterranean diets as offering lots of vegetables and fruit, some fish or poultry, small amounts of pasta, olive oil as the main fat, everything cooked wonderfully and accompanied by wine. For years, studies of such diets have shown them to be associated with much lower rates of heart disease than are typically found in groups following “Western” diets. Studies of the effects of individual components of Mediterranean diets, however, have not always yielded such consistent results. In the study you are referring to, investigators in Spain advised two groups of participants to follow a Mediterranean diet, but a control group to eat a low-fat diet. Advising people to eat in a certain way does not necessarily mean that they will. To make sure the diets differed, the investigators divided the Mediterranean diet advisees into two groups. At no cost to participants, they gave one group a liter of extra virgin olive oil a week, with instructions to use at least 4 tablespoons daily. They gave the other Mediterranean diet group an ounce of mixed nuts a day to eat at least three times a week. They measured biomarkers in the participants’ blood to confirm that they really ate the supplements. The results were impressive. Although there were no differences in overall mortality in nearly five years, the two supplemented-Mediterranean diet groups displayed about a 30 percent reduction in the risk of heart attacks and strokes as compared with the group advised to eat a low-fat diet. But, because they did not find much change in the participants’ dietary patterns, the investigators concluded that the extra virgin olive oil and nut supplements must have been responsible for the observed health benefits. What does the Mediterranean dietary pattern have to do with these results? Extra virgin olive oil and nuts are components of this pattern. Both contain “good” fats, largely unsaturated or polyunsaturated, and both are high in certain phenolic antioxidants. These features have been recognized for decades. The Mediterranean diet came to public attention in America in the early 1990s as a result of efforts of the International Olive Oil Council, a trade group established by the United Nations. The council recruited a group in Boston, Oldways Preservation and Exchange Trust, to promote olive oil to American chefs, nutritionists and food writers. If, they said, we ate diets similar to those followed by the Greeks and southern Italians since ancient times, we might also achieve similar levels of health and longevity. The council and Oldways based this idea on the results of research initiated soon after World War II. In the late 1940s, Rockefeller University sent investigators to the island of Crete to find out why its people, although living in extreme poverty, were so healthy. Once past infancy, people on Crete displayed the highest longevity in the world, rivaled only by the Japanese. Subsequent Seven Countries studies conducted by Ancel Keys and his colleagues appeared to confirm the health benefits of Mediterranean dietary patterns. Olive oil or nuts seem critical to these benefits. Besides their fat and phenol content, both are wonderful to eat. Olive oil tastes good by itself and it makes other foods, particularly vegetables, taste delicious. Nuts enliven any dish. So research on Mediterranean diets brought good news. You could eat delicious food – and it would be good for you. The Mediterranean diet took hold. In the early 1990s, you had to search hard for a decent bottle of extra virgin olive oil; now almost any supermarket carries several brands, many of high quality. Except during the sad, but blessedly brief, low-carb era, the Mediterranean diet became mainstream. But let’s be clear about what the Mediterranean diet is and is not. It is a model of the largely plant-based dietary pattern recommended by health agencies in the United States and worldwide. It does not mean supersize bowls of macaroni smothered in cheese. Olive oil and nuts, for all their virtues, are loaded with calories. The Spanish study’s 4 tablespoons provide 400 calories. An ounce of mixed nuts is about 200. Include them in your diet by all means, but most definitely in moderation. I think the best reason for following a Mediterranean diet is that its foods are terrific to eat. Pasta, vegetables, a fish, some good bread, and a glass of wine? Sounds good to me, any time. 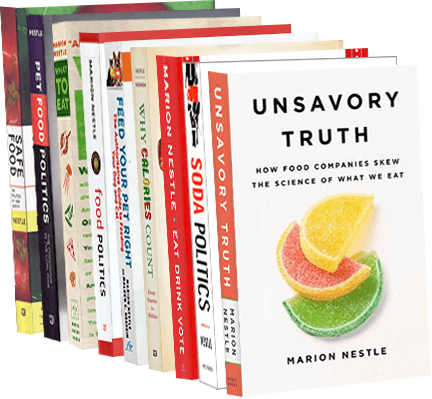 Marion Nestle is the author of “Why Calories Count: From Science to Politics,” as well as “Food Politics” and “What to Eat,” among other books. She is a professor in the nutrition, food studies and public health department at New York University, and blogs at foodpolitics.com. E-mail:food@sfchronicle.com. We eat what we buy. Both need improvement, says USDA. USDA’s Economic Research Service has just issued a report, Assessing the Healthfulness of Consumers’ Grocery Purchases. The bottom line? Americans buy fewer fruits and vegetables than recommended but far more refined grains, sugars, and meat. We eat what we buy (or are given). That’s why congressional pressure to increase grains and meat in school lunches (see yesterday’s post) is questionable from a public health standpoint. Does starvation increase longevity? Not in monkeys. The New York Times front page today has a report of a long-term study at NIH of severe calorie restriction in Rhesus monkeys. It found that calorie restriction did not extend the monkeys’ lifespan. I’m not at all surprised. My co-author and I reviewed the literature on calorie restriction for a chapter in our book, Why Calories Count. The new study makes news because it contradicts a study done in Wisconsin showing that severe calorie restriction extends life. Severe means 25% to 30% fewer calories per day that are needed to maintain normal body weight. I’d call this a starvation diet. An editorial accompanying the report of the study in Nature attributes the difference between the results of this NIH trial and the Wisconsin study to a difference in dietary composition, suggesting that calories differ in their effects. Not necessarily. The Wisconsin study allowed the control monkeys to eat a lot of junk food and they were fatter than normal. The NIH study restricted calorie intake in its control monkeys so they maintained normal weight and were healthier. This is the simplest explanation of the difference. Studies in rats, mice, and many other animals show that calorie restriction extends life. Starvation can hardly be good for health. It causes weight loss, of course, but also a host of physiological and psychological problems. These were extensively documented in humans during World War II in Ancel Keys’ Starvation studies. 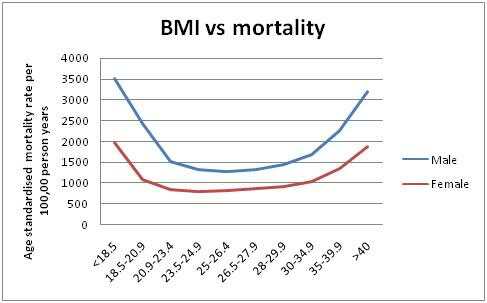 The relationship between BMI and human longevity has been examined in several recent studies, all of which show similar results: Longevity is best associated with BMIs in the range considered normal or slightly overweight. Above that range—but also below it—mortality increases. Being underweight is associated with higher mortality. The bottom line? Eat a healthy diet and balance calories to maintain a healthy weight within that range. The Diplomatic Culinary Partnerships initiative builds on Secretary of State Hillary Rodham Clinton’s vision of “smart power” diplomacy, which embraces the use of a full range of diplomatic tools, by utilizing food, hospitality and the dining experience as ways to enhance how formal diplomacy is conducted, cultivating cultural understanding and strengthening bilateral relationships through the shared experience of food. Everybody eats. This is my kind of diplomacy. Low carb or low fat: Do calories count? Nutrition and public policy expert Marion Nestle answers readers’ questions in this column written exclusively for The Chronicle. E-mail your questions to food@sfchronicle.com, with “Marion Nestle” in the subject line. Q: I’m confused about calories. If I cut calories to lose weight, does it matter what foods I eat? Or are all calories the same? A: As the co-author of “Why Calories Count: From Science to Politics,” I hear this question all the time. The short answer: Calories matter for weight. The choice of foods that provide the calories matters a lot for health and may make it easier for you to diet successfully. To lose weight, reducing calorie intake below expenditure works every time. To prove this point, a professor at Kansas State University lost 27 pounds in 10 weeks on the Twinkies diet – one Twinkies every three hours with occasional snacks of chips, sugary cereals and cookies. Even so, he cut his usual calorie intake by 800 a day. Anyone would lose weight doing that. Only four dietary components provide calories: fat (9 per gram), carbohydrate and protein (4 per gram each) – and alcohol (7 per gram). Does the particular mix of these components make any difference to weight loss? Yes, say proponents of diets low in carbohydrate, especially rapidly absorbable sugars and refined starches. Low-carbohydrate diets are necessarily high in fat, and somewhat higher in protein. Do people lose weight on them because of the effects of carbohydrates on insulin levels or because low-carbohydrate diets help reduce calories? This question does not have an easy answer, but not for lack of trying. Weight-loss studies are hard to do. Estimating calorie intake is notoriously inaccurate, and measuring calories is difficult and expensive. The first measurement study I know of took place in 1964. Investigators from the Oakland Institute for Medical Research studied weight loss in five obese patients in a hospital metabolic ward. They calculated the number of calories needed to induce rapid weight loss in each patient, and fed each of them a liquid formula diet containing that number every day. Every few weeks, they changed the formula to vary the proportions of protein (ranging from 14 percent to 36 percent of calories), fat (12 percent to 83 percent), and carbohydrate (3 percent to 64 percent). This study was conducted under rigidly controlled conditions of hospitalization and involved actual measurements – not estimations – of calorie intake and body weight. But what about weight-loss studies involving people who are not incarcerated? Since the early 2000s, numerous clinical trials have shown low-carbohydrate diets to produce greater weight loss than low-fat diets. Some also have observed improvements in blood pressure, blood glucose levels and blood lipids. But it is so inaccurate to estimate calorie intake in such studies that most didn’t bother to try. This means they can’t say whether the weight loss was due to composition of the diet or to calorie reduction. It’s possible that low-carbohydrate, high-fat diets make people less hungry, but the evidence for this is mixed. Most studies of extreme diets of any type report high dropout rates or failure to stick to the diet for more than six months or so. And even though initial weight loss is rapid on low-carbohydrate diets because of water loss, these diets are low in fiber and some vitamins. One problem with losing weight is that it takes fewer calories to maintain smaller bodies. Dieting also reduces energy expenditure. One recent study of that problem involved taking detailed measurements for several years, and illustrates the difficulties of obtaining definitive answers to questions about diet composition and energy balance. The researchers wanted to know whether diet composition affected energy expenditure in very obese people who had just dieted off up to 15 percent of their weight. They found that a low-carbohydrate diet did not slow down energy expenditure nearly as much as a low-fat diet, meaning that low-carbohydrate diets might make it easier for people to maintain weight loss. Perhaps, but study subjects were fed prepared calorie-controlled diets for only four weeks, and lost and maintained weight under highly controlled conditions. Does diet composition matter for weight maintenance in the real world? Longer-term studies by other investigators show that diet composition makes little difference in the ability to maintain weight loss. Most reviews of the subject conclude that any diet will lead to weight loss if it cuts calories sufficiently. Obviously, some diets are better for health than others. Face it. The greatest challenge in dieting is to figure out how to eat less – and to eat healthfully on a regular basis – in the midst of today’s “eat more” food environment. And that’s a much more important research problem than whether low-carbohydrate or low-fat diets work better for weight loss. Does where calories come from matter to weight maintenance? A new study says yes, but I’m skeptical. As the co-author of a recent book called Why Calories Count: From Science to Politics, I am well aware of how difficult it is to lose weight. When you are dieting and losing weight, you require fewer calories to maintain and move your smaller body, and your metabolism and muscle activity—and, therefore, your total energy expenditure–slow down. To maintain the weight loss, you need to eat less than you did before you began dieting. But what would happen if you could adjust your diet to keep your energy expenditure from slowing down? Enter Ebbeling et al in JAMA, with a comprehensive study to address precisely that question. The results of the study and editorial comments on the findings demonstrate how complicated and difficult it is to obtain definitive answers to questions about diet composition and calorie balance. The investigators asked whether calorie-controlled diets containing varying amounts of carbohydrate, fat, and protein, and varying in glycemic load (a measure of rapidly absorbable carbohydrates in foods) affected total energy expenditure in obese people who had just lost 10% to 15% of their weight, but were still obese. They found that the diet lowest in carbohydrate did not slow down energy expenditure as much as did the low-glycemic index diet, or the one lowest in fat. This study took years and involved a very large number of state-of-the-art physiological measurements. But I want to focus on the question of whether calories from all sources are metabolically equivalent. Here’s my understanding of the study. Ebbeling et al started by offering $2500 to obese volunteers to participate in a 7-month weight-loss trial. In my view, the 21 subjects who finished the study worked hard for that money. Weight-monitoring phase for 4 weeks, during which they ate their typical diets while the investigators monitored their weight. Weight-loss phase for 12 weeks, during which they were fed pre-prepared diets calculated to contain about 60% of their usual calorie intake so they would lose about 2 pounds a week. The average weight loss over 12 weeks was an impressive 14.3 kg (31.5 pounds). Weight-stabilization phase for 4 weeks, during which they were fed pre-prepared diets that provided the reduced number of calories needed to maintain their newly reduced weights. Testing phase of 4 weeks on each of three pre-prepared test diets (total: 12 weeks). All three test diets provided the number of calories needed to maintain the reduced weight. During each of the 3 testing periods, investigators measured—not estimated—the subjects’ total daily energy expenditure (resting metabolism plus activity). Note that whenever one component of a diet gets changed, the other two components change too. Because protein usually occurs in foods in relatively low amounts, a low-fat diet is necessarily a high-carbohydrate diet, and vice versa. The weight-loss part of this study showed that when overweight people were allowed to eat only calorie-controlled pre-prepared diets, they lost weight quickly and maintained the weight loss. The test-diet part of the study showed that the diet lowest in carbohydrate (and, therefore, highest in fat) had the least effect in slowing down total energy expenditure. The diet that slowed down overall energy expenditure the most was the one lowest in fat. If these results are correct, people eating high-fat, low-carbohydrate diets are likely to have the easiest time maintaining weight loss. In contrast, people on low-fat, high-carbohydrate diets are likely to have a harder time maintaining weight loss. But does this mean that calories from different sources have different effects on metabolism? Proponents of the Atkins (high-fat, low carb) diet say yes, according to an account in USA Today (in which I am also quoted). I’m still skeptical. The subjects in this study lost and maintained weight under highly controlled, calorie-restricted conditions, in which the calories came from a relatively low-fat, moderate-carbohydrate, high-protein diet (average diets contain 10% to 15% protein). Each diet was consumed for only 4 weeks. A weight stabilization protocol…may not have adequately accounted for changing energy needs associated with readjustment to new diets. These provocative results…emphasize the current incomplete knowledge base regarding the importance of dietary macronutrients and energy expenditure, especially after weight loss. Under the relatively short, highly controlled feeding conditions of this study, the composition of the diet may indeed matter to metabolism. But does diet composition matter for weight maintenance in the real world? Other longer term studies of “free-living” people out and about in their communities show little difference in weight loss or maintenance between one kind of diet and another. If you want to lose weight, eat less (it worked well for the subjects in this study). It may help to avoid excessive consumption of sugars and easily absorbed carbohydrates. Once you’ve lost weight, adjust your calorie intake to maintain the weight loss. And understand that science has no easy answers to the weight-loss problem. Paul Kindstedt, Cheese and Culture: A History of Cheese and its Place in Western Civilization, Chelsea Green, 2012. Kindstedt, a professor of food science at the University of Vermont and co-director of its Institute for Artisan Cheese, has organized his history by time period and region, from the Paleolithic origins of cheese to current attempts to regulate raw milk. His material is well referenced and the book is full of facts and observations that will delight cheese lovers. Seamus Mullen, Hero Food: How Cooking with Delicious Things Can Make Us Feel Better, Andrews McNeel, 2012. I don’t usually blurb cookbooks but I couldn’t resist this one from Seamus Mullen, the chef-owner of Tertulia in lower Manhattan. This gorgeous book proves without a doubt the point I’ve been making for years: healthy food is delicious! Take a look at what Seamus Mullen does with vegetables, fruit, grains and everything else he cooks. I can’t wait to try his 10 Things to Do with Corn. His food can’t guarantee health, but will surely make anyone happy!